Did you say 'phytoplankton' ? Phytoplankton, the most abundant type of life found in the ocean, are microscopic marine plants that drift on or near the surface of the sea. Microscopic plankton have been called 'the grass of the sea' because they are the basic food on which all other marine life depends. Even us, on land, we could not live without them: despite forming less than 1% of global biomass, phytoplankton perform half of all photosynthesis, breathing out oxygen into the atmosphere. They also absorb a large amount of the surplus carbon dioxide generated by human activity, mitigating the greenhouse effect. What is a bloom ? 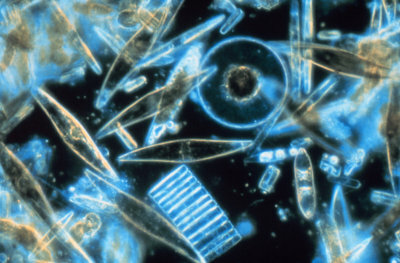 A bloom is an explosion of the plankton population. It can be caused by favourable particular light conditions or water eutrophication. Eutrophication designates a massive nutrients arrival. 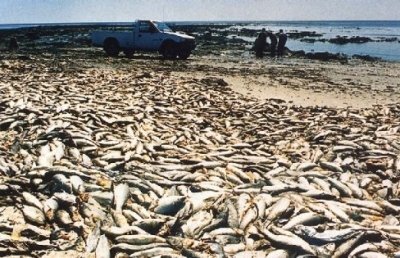 It is either caused by natural and seasonal processes or induced by human activities (nutrient pollution). 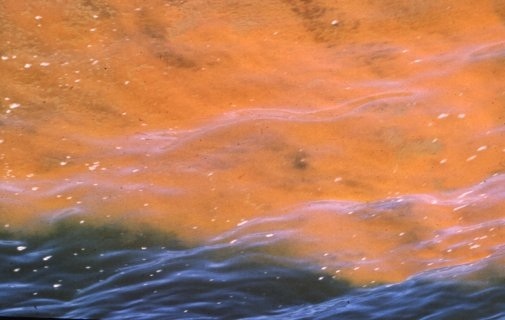 This red tide is a toxic algal bloom. Photo: Alexander Mustard/NOCS. Marine phytoplankton seen through a microscope. Photo: N. Sullivan/NOAA/Department of Commerce. Some microscopic algae species can be dangerous. If they surge out of control during optimal blooming conditions they can exhaust water of oxygen and suffocate larger fish. Other species can release toxins into the water. These events are referred to as Harmful Algal Blooms (HABs). Early bloom detection by satellite allows fish farmers to sample the blooms, and - if blooms are found harmful - to put mitigation strategies in place, such as pumping oxygen into the water around caged fish. 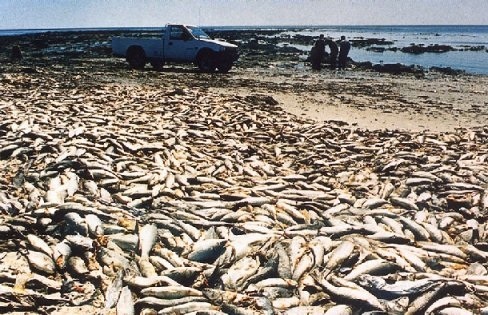 Dead fish caused by an HAB event. Photo: Alexander Mustard/NOCS.